A joker who goes around asking for his schoolmates to share their lunch with him. 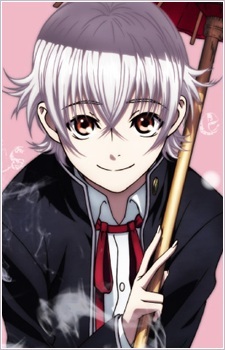 Yashiro is soft-spoken but very charismatic. He is very friendly and well-liked. In addition, he is quite respectful towards anyone he meets, even robots. He is supposedly a normal high school student, until he suddenly finds himself being pursued by several factions - HOMRA, SCEPTER 4 and Kuroh Yatogami - who believe him to be the murderer of Tatara Totsuka, a member of HOMRA. He is also somewhat laid-back and happy-go-lucky. Yashiro carries also a red, Japanese style parasol with him at all times. His real name is Adolf K. Weissman and he's the Silver King, formerly a researcher in Germany who experimented with the effects of the Dresden Slate. The Colorless King was once in control of "Yashiro's" body, but once he took control of Weissman's original body, their spirits switch. He had amnesia ever since episode one and he regains his memories in the 11th episode, finally bringing light to the confusing situation. At the end of season one, he goes missing.